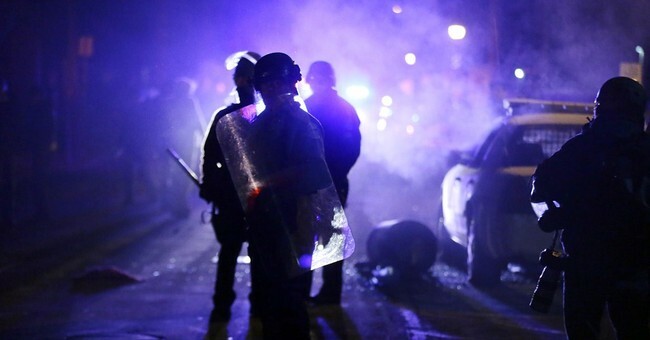 In the once sleepy bedroom community of Ferguson, Missouri, the protests rage on daily. Not one day of rest or respite from the bongo’s banging, incessant chanting, or incoherent screaming for the beleaguered residents. Most recently two officers were shot as a night of protesting wrapped up, raising the tension level and stakes for officers nationwide. When will this ever end? How many people have to feel the direct impact of Mike Brown’s criminal actions before the #BlackLivesMatter crowd wakes up and sees their true enemy? Here’s a hint: It’s not racism. Understandably, cries of racism ensued at the outset. A black man shot dead in the street by a white officer, the body lying there for four hours. Emotions ran high and without credible eyewitness testimony the lowest denominators drummed up an implausible story: Brown was executed. But video footage of Brown’s last movements painted an entirely different story: A young man on the prowl after committing a strong-armed robbery. Forensic evidence and multiple autopsy reports showed a violent altercation initiated by Brown that ended with justified use of force by Officer Wilson. Not only did the Clayton, Missouri grand jury find no reason to indict, the Department of Justice followed up with the same conclusion. If the finding was unjust, why not protest the DOJ? Because Attorney General Eric Holder came to Ferguson and said he was “one of you,” thereby inoculating him from any responsibility to those in the protest movement as to whether or not Wilson was charged. Besides, Holder has done everything in his power to focus this story on racism, when it has absolutely zero to do with that. Holder employed a shell game to keep Americans from seeing what is being done to them. The DOJ investigation of the shooting in Ferguson uncovered what Holder, President Obama and the not so Reverend Al Sharpton are all not talking about: Big Local Government. A local government that is so big and so hungry for cash, it issues directives to police officers to increase revenue by 12 percent, requiring them to issue multiple citations per stop or face layoffs in the department. If citizens, taxpayers, democrats and even black people realize this, and considered the ramifications of what is being done to them and by whom, they would no longer bang drums and constantly obsess about race. Black people would stop voting for individuals and a party that sees them as revenue generators, the purveyors of a government that seeks to be their fathers, mothers, overlords and judges. A government that lies in wait for them at night to cite them as they return home from work, government that sits around the corner each morning waiting for them to get up and head out to work so they can be pulled over, cited, and fined multiple times at each interaction in order to meet revenue targets. Where are the Republicans? The GOP should be screaming from the rooftops that if you wish to be left alone to work, recreate, and live in peace without looking over your shoulder, come to the Right! The party of limited government and lower taxes is against this type of out-of-control lunacy that pits small towns against their police forces in a never-ending fight over money. When will someone point out that the Democrats are fine with this behavior? Whom exactly does the president mouthing the words “there’s no excuse for shooting cops” fool? President Obama’s previous statements clearly called for more protests and less understanding among Americans. Instead of doing the tough job of directly communicating this to frustrated black people, Republicans are fixated on Eric Holder and his race baiting, which is exactly what Holder wants. He cries racism and moves the shells. As long as the Right attempts to defend against the racism charge, the party is unable to speak about the true criminal action that is present all over this country. Whether it’s tourists of every race getting caught in speed traps to generate revenue, or the yearly requests for tax increases to fund new municipal centers, police department buildings, and fire houses, or the outrageous requests to increase public employee pay, it’s always about government requiring more money. Government wants nice shiny new things and it will find a way to fund bigger paychecks and greenbacks to obtain the shiny pretty new things. The only way to stop government from getting what it wants from you is to vote in people who will control government, not be controlled by it. As a black person, I’ll assume I’m not a racist for baldly pointing this inconvenient fact out.